It has just turned winter in the Northern Hemisphere, which means that it is now summer in the Southern Hemisphere. The Japanese whaling fleet has entered the Southern Ocean to kill up to a self-designated quota of 333 minke whales, and Sea Shepherd has given chase. 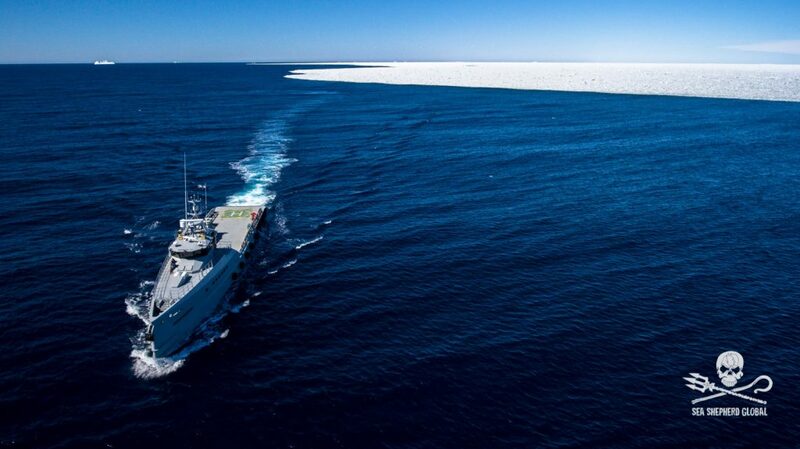 Ocean Warrior, Sea Shepherd’s newest ship, moving beyond pack ice in the Southern Ocean. We have heard the story before, and many of us have watched the drama play out during six seasons of the TV series “Whale Wars” on Animal Planet. This year, Sea Shepherd hopes to have an advantage with a ship declared to be faster than the Japanese whaling vessels, as I explained in Water Ways at the end of August. On Dec. 3, the Sea Shepherd vessel Steve Irwin left Melbourne, Australia, for the Southern Ocean for its 11th campaign against the whalers. The Steve Irwin was followed a day later by the new ship, Ocean Warrior. Yesterday, the Ocean Warrior located one of the Japanese harpoon vessels, the Yushin Maru, inside the Southern Ocean Whale Sanctuary, according to Capt. Adam Meyerson, the skipper of the Ocean Warrior. “The crews of the Ocean Warrior and the MV Steve Irwin have been battling through thick fog and ice to protect the whales in the Australian whale sanctuary,” Meyerson said in a news release. “The Yushin Maru was hiding behind an iceberg and came out on a collision course. Japanese whalers recently returned to the Antarctic with a new plan to kill 333 minke whales for scientific research, defying official positions of many countries throughout the world. A harpooned minke whale lies dying, as whalers aboard the Japanese ship Yushin Maru Number 3 attempt to finish it off with rifle shots. Japan called off the annual whaling program for one year after the International Court of Justice ruled that Japan’s commercial whaling operation failed to meet the basic requirements of scientific research. Japan had been using an exemption for research to get around a ban on whaling under international treaty. Japan submitted a new “research” plan for this year’s whaling, but the document has yet to receive any official sanction. In fact, Japan’s return to the Southern Ocean has been condemned by at least 33 government leaders. Russell F. Smith II, U.S. commissioner to the International Whaling Commission, said the U.S. government does not believe it is necessary to kill whales to carry out scientific research consistent with objectives of the IWC. 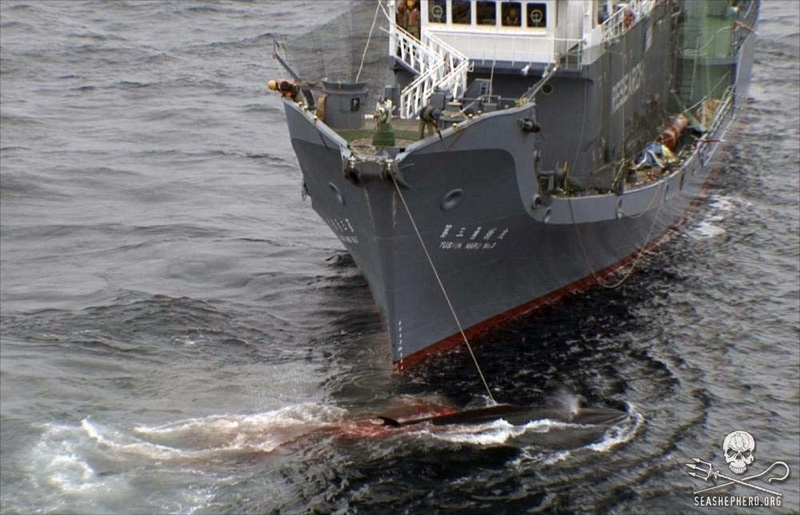 Two key IWC committees have raised serious questions about Japan’s whaling program, he said. Japan’s plan for whaling this winter (summer in the Southern Hemisphere) is to kill 333 minke whales, down from 935 minkes in plans for previous years. In this new plan, the Japanese government has not sanctioned the killing of humpback or fin whales, for which the previous goal was 50 of each. Although the Japanese government has declared that an annual harvest of 333 minke whales is sustainable, the International Whaling Commission has not approved the whale hunt nor even begun discussing possible quotas or how any harvest, if approved, would be allocated among other countries. Meanwhile, the Japanese government has informed the United Nations that it will no longer submit to the jurisdiction of the International Court of Justice for “any dispute arising out of, concerning, or relating to research on, or conservation, management or exploitation of, living resources of the sea.” See story, Sydney Morning Herald, Oct. 19, 2015. Australia, which brought the international lawsuit against Japan, is now considering another round in the legal battle. The effort could put Japan back in the spotlight, even though success would be unlikely if Japan spurns the court’s jurisdiction, according to reports in the Sydney Morning Herald on Dec. 8, 2015. Australian courts also ruled against the Japanese whalers for violating protection provisions within the Australian Whale Sanctuary around Antarctica, although Japan does not recognize Australia’s jurisdiction. The whaling company, Kyodo Senpaku Kaisha, was fined $1 million (in Australian dollars) for contempt of an injunction against killing Minke whales within the sanctuary. Other countries have joined the overall opposition to Japanese whaling. New Zealand Prime Minister John Key said his country’s ambassador to Tokyo delivered a “strong” formal message to Japan from 33 countries. Read the statement on the New Zealand Embassy’s webpage. Sea Shepherd Conservation Society, which directly interfered with the movements of Japanese whaling ships in past years, may take a more low-key role on whaling this year. The organization’s ships have become involved in new campaigns to halt poaching of other species, including the endangered toothfish in Antarctic waters. See news release Oct. 13, 2015. Sea Shepherd’s U.S. affiliate was enjoined by the U.S. courts from interfering with the whaling operations, but Sea Shepherd Australia continued the high-seas battles, as featured in the television series “Whale Wars” on Animal Planet. Now, the Sea Shepherd ship Steve Irwin, which was undergoing repairs in Melbourne, Australia, is headed into the Southern Ocean on its second campaign against toothfish poaching. Alex Cornelissen, CEO of Sea Shepherd Global, says new battles against the Japanese whalers are not out of the question. “Sea Shepherd is an anti-poaching organization,” Cornelissen said in a news release. “We are ready to find, document, report on and where possible intervene against poaching operations that threaten the precious balance of life in the Southern Ocean; whatever form those poachers might take, whatever life they threaten. The seventh season of “Whale Wars” — a three-hour presentation premiering on Friday — follows on the heels of an unresolved contempt-of-court ruling against Sea Shepherd Conservation Society earlier this month. The new program, to be shown at 5 p.m. and again at 8 p.m. on Animal Planet network, documents the 2013-2014 Antarctic whaling season and the sometimes-violent confrontation between Sea Shepherd and Japanese whalers. Check out the Sneak Preview. While Sea Shepherd faces some serious court rulings, the Japanese government finds itself in conflict with the International Court of Justice, which concluded that its “scientific” whaling program does not conform to scientific principles — which was the legal justification for the program — so the whaling must stop, at least for now. See Water Ways, March 24, 2014. “Sea Shepherd US’s separation strategy effectively nullified our injunction by ensuring that OZT (Operation Zero Tolerance) proceeded unimpeded, in part by using former Sea Shepherd US assets. 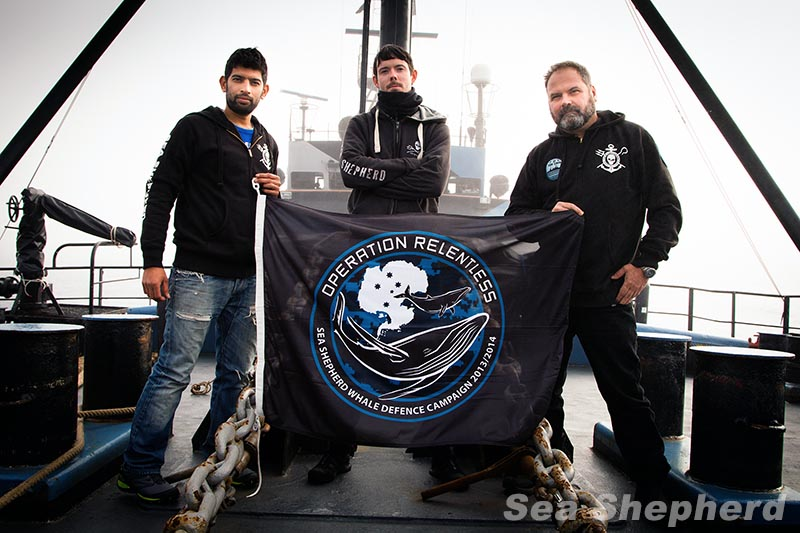 Sea Shepherd US ceded control over OZT to Sea Shepherd Australia and other Sea Shepherd entities it believed to be beyond the injunction’s reach, knowing these entities were virtually certain to violate the injunction. These court findings were all related to Operation Zero Tolerance, the Sea Shepherd campaign that ended in March of 2013. The ruling did not address Operation Relentless, which ended in March of 2014 and is the subject of Friday’s “Whale Wars” event. I wonder if Japan will attempt to use the U.S. courts to collect for damages related to the latest conflict. The International Court of Justice ruling against the Japanese whaling operations seems to have had no effect on how the U.S. Court of Appeals views Sea Shepherd’s actions. Sea Shepherd’s activities were still illegal, the court ruled, and the injunction would still be needed if the whaling were to resume under conditions acceptable to the international court. See “order denying defendants’ motion to dismiss” (PDF 308 kb). In fact, although whaling was suspended for the 2014-15 season, the Japanese government has submitted a new plan (PDF 2.3 mb) to resume whaling at this time next year. The plan calls for an annual harvest of 333 minke whales — as opposed to the previous plan to take 850 minkes, 50 humpbacks and 50 fin whales. For additional insight on the controversy, read Dennis Normile’s piece in Science Insider, affiliated with Science magazine. Japanese whalers who hunt whales in the Antarctic can no longer justify their actions as “scientific research” and must stop their annual whale roundup, according to a ruling by the International Court of Justice. “Taken as a whole, the Court considers that JARPA II involves activities that can broadly be characterized as scientific research, but that the evidence does not establish that the programme’s design and implementation are reasonable in relation to achieving its stated objectives. He said Japanese officials would need to digest the judgment before considering a future course of action. He refused to discuss whether a new research program could be crafted to allow whaling to resume. Japanese officials say objections to its scientific whaling program are based on moral arguments, not legal ones. Australia cannot win this case, Japanese officials say, because the international treaty allows for scientific whaling and it allows member countries to determine for themselves what qualifies as science. This legal position is explained in a story written by Andrew Darby published in yesterday’s Sydney Morning Herald. A later story by Darby, published in today’s Herald, reports on the surprising testimony by a witness called by the Japanese government. The witness, a Norwegian expert named Lars Walloe, described several problems he had with the Japanese research, but he confirmed that it was research. Whether Japan’s annual whale hunt is a true scientific endeavor or a commercial operation without legal justification is the question being debated before the United Nations highest court this week. Australia, supported by New Zealand, brought the case against Japan to the International Court of Justice, which is holding hearings in The Hague, Neatherlands. Australia hopes to bring Japan’s whaling activities under normal prescriptions from the International Whaling Commission, as opposed to the ongoing scientific permits issued by the Japanese government that allow for hundreds of whales to be killed each year. Bill Campbell, Australia’s agent to the court, addressed the 16-judge panel in the Great Hall of Justice, according to a report by Mike Corder of The Associated Press. Japan, which will present its side next week, has stated that it will challenge the court’s authority to hear the case while justifying its whaling operations under international whaling agreements. “There are no winners and losers in this,” said Sir Geoffrey Palmer, New Zealand’s former prime minister. “It ain’t over til it’s over, and even then it ain’t over. There will be a pause. We will resume discussions about this next year,” he told The Associated Press. As the IWC meeting ended today, Greenland’s native population was granted permission to hunt a few humpback whales for the next three years, expanding the list of species the Greenlanders are allowed to kill under the license of subsistence hunting. Whaling moratorium talks break down — so whaling nations will continue to set their own limits. Changes in the governance of the International Whaling Commission will be considered. See report in Reuters. The future of the International Whaling Commission — and perhaps even the survival of certain whale species — rests on decisions being made this week in Morocco. While I have no personal insight into this story, I think it’s worth summarizing activities swirling around the meeting that began today. If you haven’t heard, a controversial proposal by IWC Chairman Cristian Maquieira would lift the ban on whaling for Japan, Iceland and Norway. In return, the three countries would come back into the fold of the IWC, with new quotas officially imposed by the commission to reduce recent harvest levels. Maquieira says his plan could save thousands of whales a year. (Check out an article Maquieira wrote for the BBC or read a press release (PDF 40 kb) issued by the IWC.) As the annual meeting of the IWC got under way today, Maquiera was not present due to illness, according to reporter Arthur Max of the Associated Press. Deputy Chairman Anthony Liverpool opened the meeting then quickly moved the discussions behind closed doors for two days of negotiations among the strident anti-whaling countries as well as those that insist that whaling is a long-held cultural right. It’s in those meetings that things may come to a head. Currently, Japan, Iceland and Norway set their own whaling quotas. Japan claims an exemption in the IWC Charter that allows for the taking of whales for scientific research — even though nearly all the whale meat ends up in the commercial market. Iceland and Norway operate under a process that allows formal objections to the whaling moratorium. End all whaling in the Southern Ocean Whale Sanctuary near Antarctica. All whale products must be consumed in the country for which the hunt was authorized. Catch limits must be calculated by the IWC’s scientific committee to assure appropriate management procedures. Harvest of threatened, endangered or vulnerable species would not be allowed. Scientific whaling beyond the limits set by the IWC would not be allowed. Contracting governments must agree not to operate under objections to the agreement as originally allowed in the IWC Charter. Japan has hinted that it might pull out of the IWC if member nations can’t abide its whaling activities. Meanwhile, Australia has filed an action against Japan in the International Court of Justice, saying Japan’s actions are a direct violation of the international whaling ban in the Southern Ocean. International politics and intrigue run thick through this whole story. Check out last weekend’s Times of London for an investigative report accusing Japan of bribing officials of other countries to come to the IWC meeting and support whaling. It will be interesting to see if members of the IWC can find a way to make the organization relevant again.